Note: this article was originally published to the Wharton Computing Development Center. Recently the Learning Lab has been discussing ways to do team development as we transition to Flex 2 and the Eclipse IDE. We’re starting a project now that will involve four developers, so we’ll need to keep our own working copies of the project. Not an earth-shattering idea, but it’s new for us–we usually share a single code base during development. Ted, who has the most Eclipse experience in the group, suggested that Ant, a java-based build tool, could be used to make the team development process smoother. Because Ant ships with Eclipse and because Adobe recently released custom Flex Ant tasks, in theory it should be possible to create an Ant script that will mimic the default Flex build process and also perform extra tasks such as moving files around. In practice, however, it’s not easy to create such a script if you’re new to Flex 2, Eclipse, and Ant because the documentation is scattered between all three products (as well as some blogs). So I munged the available information into a single “how to.” The steps below show how to implement a very basic Ant build script that will copy Flex code from the “master” code base to your working area, compile it, and create the swf html wrappers. 1. If you’re using the stand-alone version of Flex Builder, follow these directions to set up the Ant environment: http://www.peterelst.com/blog/2006/09/03/flex-builder-2-ant-support/. Skip this step if you’re using the plug-in version of Flex Builder. 3. Open your Eclipse Flex project and add a build file to it. An Ant build file is an XML document that contains a series of tasks called “targets.” A sample build file template is attached. FLEX_HOME: points to the location of your Flex SDK. By default this location is C:Program FilesAdobeFlex Builder 2Flex SDK 2 for the standalone version of Flex Builder and C:Program FilesAdobeFlex Builder 2 Plug-inFlex SDK 2 for the plug-in. 5. Open the Eclipse Ant window: Window–>Other Views (select Ant from the Show View window). a. 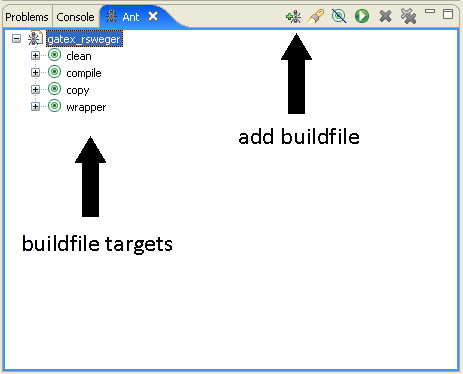 In the upper-right hand corner of the Ant window, click the Add Buildfiles button (i.e., the button with the picture of an ant). b. From the Buildfile Selection window, choose your build file and click OK.
c.	You should now see your build file displayed in the Ant window. You can expand the individual tasks (i.e., targets). d.	You should be able to execute the individual tasks in the script by double-clicking them. Output will appear on the console. This is as far as I’ve gotten. I’ve been using the built-in Flex compiler when working in my sandbox and the Ant script to get the latest code updates from the main project folder. It seems like a lot of work just to copy files around, but once the initial setup is complete it’s a handy way to avoid manually pushing updates from SourceSafe and potentially overwriting changes. No doubt there’s much cooler things you can do with Ant–if anyone has any tricks, please share! Note: this article was originally published to the Wharton Computing Developer’s Center. 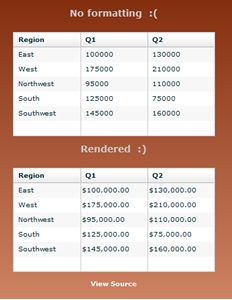 While working on a Flex 2 application, I needed to render the contents of several datagrid columns as currency. I knew how to create an mxml item renderer to do the job, but the code required hard-coding the name of the datagrid column (i.e., each column would require its own renderer). Ben Forta’s blog has an entry about using ActionScript to create a reusable item renderer for this situation. Using his code sample and tweaking it based on a commenter’s suggestion, I created a reusable currency renderer in a few lines of ActionScript. The renderer can be attached to any datagrid column that requires currency formatting–no hard-coding required. Also, as someone new to Flex, ActionScript, and object-oriented programming, I found the simple renderer example to be a good way to start understanding how Flex 2 customization works. Click here for the sample renderer and source code view. The above error-handling works most of the time. However, if there is a run-time T-SQL error (for example, a missing object or a divide by 0 error), the offending statement fails but the rest of the transaction executes. In my case, the second insert failed because Table2 had been renamed. The subsequent @error check was never invoked, so the first insert wasn’t rolled back. This behavior can be overridden by setting SET XACT_ABORT to ON, which specifies that the current transaction will automatically roll back in the event of a T-SQL run-time error.